Electronic versions of the stories featured in our Primary Extra teaching packs, suitable for use with various digital reading devices & apps. These digital books don't include the worksheets, classroom resources & activities. 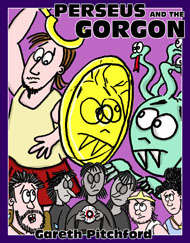 Five famous Greek Myths, retold in an easy to understand way using simple text and fun, cartoon illustrations. A perfect way to quickly learn the stories of the heroes Heracles (known to the Romans as Hercules), Perseus, Icarus, Theseus and Orpheus. What would it be like if you were taught by a robot? Find out in this short, simple illustrated story for iPad. 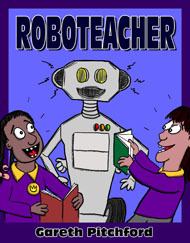 Class 3 would never forget the day their teacher was replaced by a robot. Roboteacher made them work hard but he was also lots of fun. This ebook is free to download. Known to the Romans as Hercules, Heracles was the 'hero of heroes', the most famous adventurer of them all. 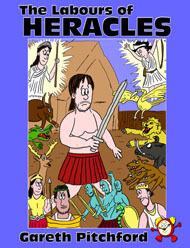 Part of the Primary Extra Quick Myths series, the story is presented in an easy to understand way with simple text and eight cartoon pictures for each of Heracles' tasks. Written and illustrated by Gareth Pitchford, this new version of the popular Greek myth features the tale of Perseus and his battle with Medusa. 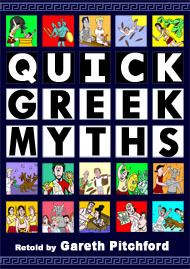 Part of the Primary Extra Quick Myth series, the story is presented through twenty full-colour cartoon illustrations and simple, easy to understand text. The eBook also features the bonus stories 'King Midas and his Golden Touch' and 'The Trojan Horse'. The town of Prosaic was a dull, boring place. That was until a group of aliens, led by Greg Arious, arrived with a special gift. 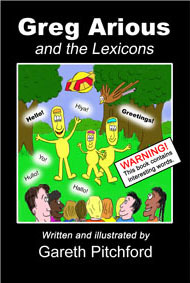 ‘Greg Arious and the Lexicons’ has been designed to help teachers introduce the concept of synonyms and to demonstrate the use of a thesaurus to Key Stage 2 children.